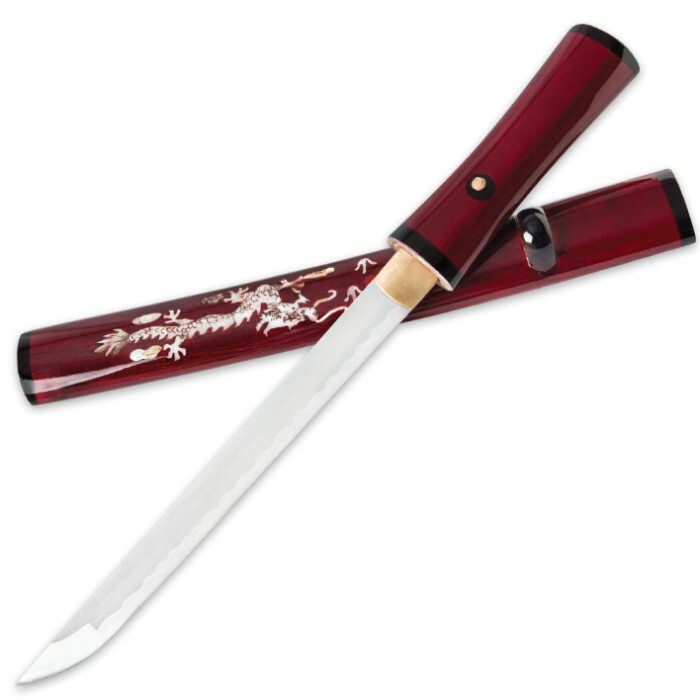 Part of our Mother of Pearl series, the Dragon Tanto has a stunning ceremonial appearance. Mother of pearl is painstakingly inlaid on both sides of the saya to form the dragon and raising sun pattern. Completely smooth, the pattern is under the glossy lacquered finish. No two tantos are the same! Makes an excellent companion to your larger Shirasaya swords. Although it proved hard to photograph, the mahogany red and black wood grain is very well pronounced and beautiful to behold in person. The blade comes stout, extremely sharp, and with an attractive hamon. The construction is rock solid. 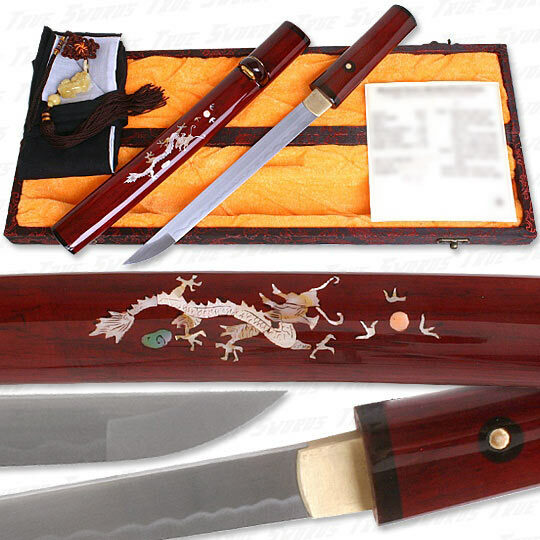 a great looking Mother of Pearl Dragon Tanto Sword only thing that would make it perfect would be if it was full tang. First things first, the moment I had taken the tanto from its scabbard, I immediately knew not to even attempt playing around with it as if it is some kind of toy. The blade came sharper than any other bladed weapon I own, so I have no complaints there. 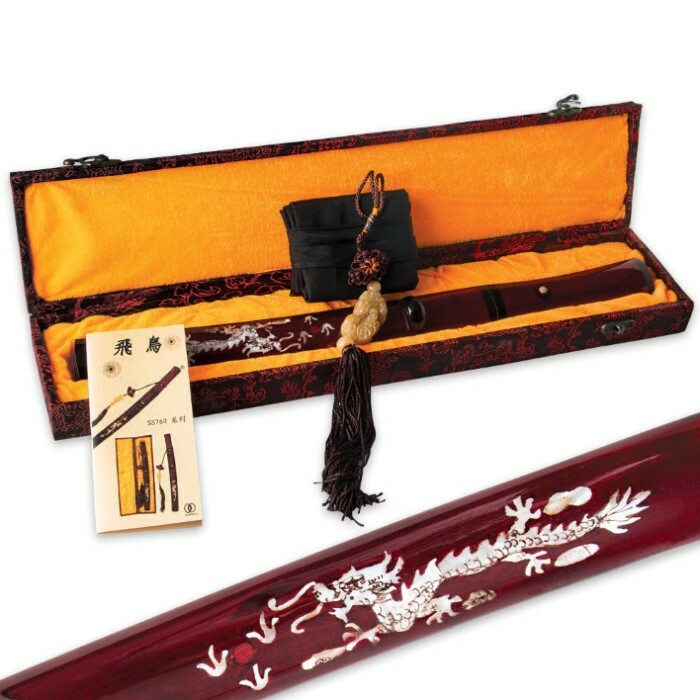 The entire tanto itself along with its case and adornment were all also stunningly beautiful. I absolutely love this tanto as a whole and would definitely recommend it for any of those who collect bladed weaponry. Now back to the subject; first of all this piece of art should NOT be treated as a toy, but not that you would dare because it is SO WELL MADE it's incredible. Even the Jade adornment is authentic jade! The blade fits into the sheath TIGHT and perfectly and you can tell lots of details were put into this blade, from the pearl inlays (same design but will vary since it's hand made) to the wood used. It is literally an antique replica. The photos do not do it justice. I did see this at another site, but it was twice the price. If your lady likes Japanese Art her this. This Tanto is a great buy, the blade is nice and long and the in lay is excellent. 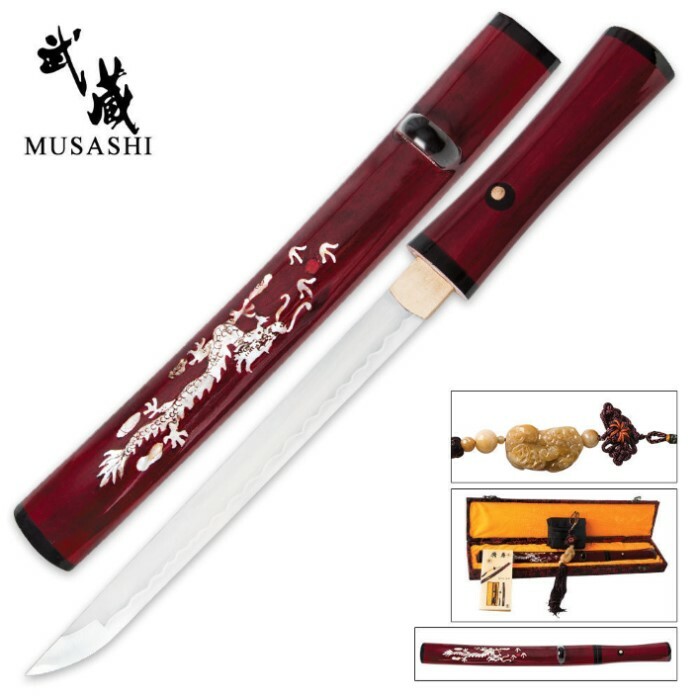 It has a snug fit into its saya and as a whole really attracts the eye. I have no problem and found no defect in this, excellent. There is a lot of attention to detail on this one. It is made like a tanto is suppose to be. It is not a failed sword turn in to a knife. The in lay work is very eye catching and well done. The blade was all but flawless. The blade fits nicely in to the saya to the point that it takes some effort to draw. I have no complaint there. Over all a very nice blade with a balance of beauty and elegance. Beautiful blade. Amazing artistry, sharp edge, though needs some work to be razor, wonderfully detailed jade dragon charm. Worth every penny and more. Thank you TrueSwords for this amazing item! First off, this is an amazing piece, and a great value for the price. The only problem I've had are firstly, it came with almost *no* edge. This was a bit surprising, as I was expecting the razor-sharp, hand-honed edge advertised. Secondly, the tsuba came with some scratches, as if it had been sheathed and unsheathed dozens of times, and roughly. The scratches were small, though, and not a big deal. Also, the box wasn't quite as quality as I would have liked. In spite of it's small problems, I'd still give it a five star rating because of the very reasonable price. I would highly recommend this tanto for any collector. You won't find a higher quality piece in this price range. You must see in person to believe. Recommended for those who actually study Kenjutsu, Kendo, Aikido and the like. These ARE NOT TOYS! If you want to play around with something, get something cheaper and of lesser quality.